Ernest Tucker was born in Yeovil in 1893, the son of glove leather parer Robert Tucker (1861-1936) and Annie née Hodges (1864-1922), both of Yeovil. Robert and Annie are known to have lived in Addlewell Lane in 1891 but by the 1901 census they were living in Brunswick Street with their six children; Elizabeth (b1889), Percy (1891-1976), eight-year old Ernest, Annie (1895-1911), Harry (b1897) and Thomas Edward (1899-1971). Also living with them was Annie's brother Thomas Hodges. Their first child Huld (Harold? - b1886) was not present, and the following year Robert and Annie would have another daughter, Emily. In all Robert and Annie had ten children although three died in infancy. By the time of the 1911 census the family must have been in poor circumstances; 56-year old Robert was not working and 49-year old Annie gave her occupation as "Washing Most Times". Worst of all for the family, they had moved to 33 New Prospect Place, earlier known as "The Colony". It was a long terrace of small cottages, little better than slums and occupied by the very poorest families. At the time of the census the only children living there were Harry, Thomas and Emily - I could find no trace of Ernest. The family later lived at Morton Terrace, Newtown. It is known that Ernest enlisted at Yeovil on 10 December 1915 and was initially a Private in the 9th Battalion, Somerset Light Infantry. His Service Number was 20762. His attestation papers, shown below, indicate that he enlisted for 'Short Service' meaning for the duration of the war. He later transferred to the 1st/12th Battalion (The Rangers), London Regiment. Rifleman Tucker's Service Number was 7705. This was a Territorial Force unit which existed before the war and the men who agreed to go overseas on the outbreak of war (not all did) formed the first line battalion, i.e. the 1/12th London Regiment (The Rangers). Back in England new recruits and anyone left over from the original battalion, etc., formed a second line battalion, i.e. the 2/12th based in England for training purposes and from this unit drafts would have been sent out to replenish losses in the 1/12th. Until the summer of 1916 the drafts of men sent for active service would normally have gone to their own first line battalion but, such were the losses in the first days of the Somme battle that this policy was abandoned. In the 56th (1st London) Division, of which the 1/12th Londons were part, men from the various reserve battalions in England were split up across the whole division and some went to completely different divisions. Because of this it is not possible to determine exactly where Ernest fought but suffice to say he was engaged in the overall Somme Offensive. On 25 September 1916 he was reported as wounded in this conflict and died from his wounds on 10 October 1916. He was aged 23. A report from the 6 October 1916 edition of the Western Chronicle (shown below) noted that Ernest had been wounded and had a broken arm. 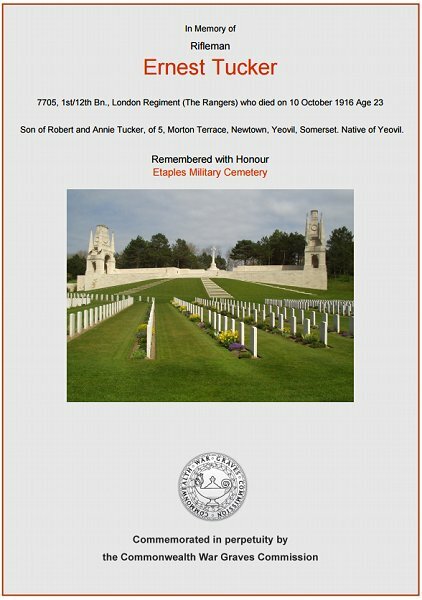 However the Western Gazette, in its edition of 20 October 1916, reported "Private Ernest Tucker, of the London Rangers, son of Mr and Mrs R Tucker, Morton Terrace, Newtown, who was previously reported wounded in action has succumbed to his wounds. 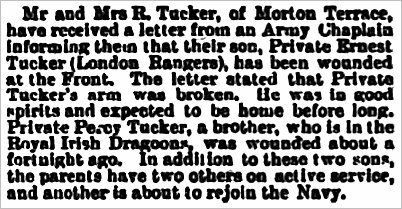 Private Percy Tucker, a brother, who is in the Royal Irish Dragoons, was wounded about a month ago. In addition to these two sons, the parents have two sons on active service, and another is about to rejoin the Navy." Ernest was interred in Etaples Military Cemetery, Pas de Calais, France, - Grave VII.B.4A, and his name is recorded on the War Memorial in the Borough. A report from the 6 October 1916 edition of the Western Chronicle noting that Ernest had been wounded and had a broken arm. The Commonwealth War Graves Commission certificate in memory of Ernest Tucker.